Stacey is a Registered Veterinary Technician that graduated from St Claire College in 2004. She joined the Campus Estates team in March 2016 with experience in small animal and emergency medicine. Stacey is passionate about volunteering her skills as a Veterinary Technician. She has done volunteer work through Vet Nurses in the Wild in South Africa and has participated in large scale spay neuter programs in Peru and Nicaragua through World Vets. When Stacey is not working with us at Campus Estates, she manages 2 yoga studios in Hamilton. 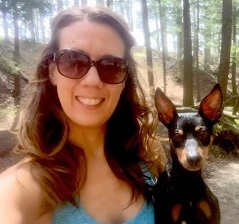 She enjoys hiking and spending time outdoors with her Miniature Pinscher Theo.